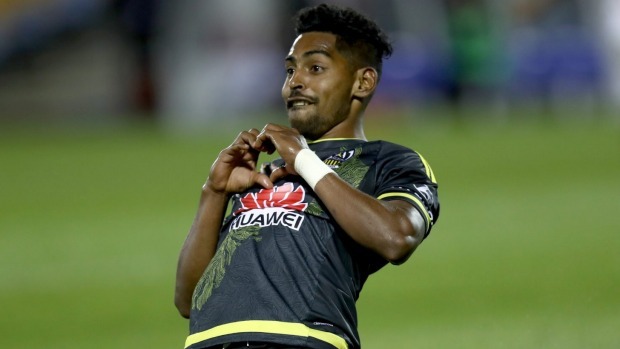 The Wellington Phoenix’s leading scorer Roy Krishna was voted the club’s Players’ Player of the Year on Tuesday night. Wellington Phoenix strike partners Roy Krishna and Kosta Barbarouses have shared the club’s Player of the Year awards. Krishna’s 12 goals saw him collect the club’s Golden Boot, while those goals also helped him to be voted the Players’ Player of the Year. Right back Jacob Tratt, who starred in the first 20 games of the season before leaving the club for personal and family reasons, was named the Under-23 Player of the Year. The club’s last foundation player, Vince Lia, was honoured for his 10 years of service to the club alongside kit man and media manager Russell Gray. His round 10 screamer against the Central Coast Mariners in Hamilton was chosen as the club’s goal of the season, which could prove to be Lia’s last in a Phoenix shirt as he is expected to leave the club with his contract set to expire. Ken Allen was named Volunteer of the Year, while Stephanie Evett was Fan of the Year.